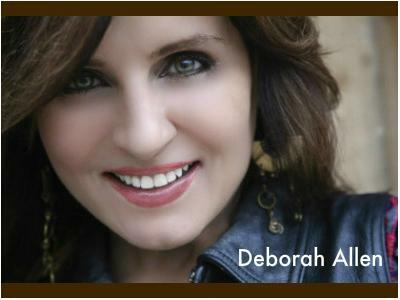 Country artist Deborah Allen returns to the music scene with her new album Hear Me Now featuring the current radio single Anything Other Than Love. She co-wrote that song with hitmaker Gary Burr. In fact, Deborah wrote or co-wrote every song on the album - and is a producer on it. But songwriting - and success with it - are nothing new for this Grammy-nominated artist. She's had her songs recorded by a long list of acts including LeAnn Rimes, Brooks & Dunn, Patty Loveless, Conway Twitty, Tanya Tucker, and even Fleetwood Mac. “Deborah is singing better than ever, which is saying a lot!” says her close friend, legendary CMA Hall of Fame songwriter Bobby Braddock, who produced three tracks on the album. Born in Memphis, she moved to Nashville at 18 years old and was soon discovered by Roy Orbison. Country fans know and love her biggest songs which include Baby I Lied (grammy-nominated), I've Been Wrong Before and I Hurt For You.